Enslaved Africans and Creoles in the French colony of Saint-Domingue are said to have gathered at a nighttime meeting at a place called Bois Caïman in what was both political rally and religious ceremony, weeks before the Haitian Revolution in 1791. 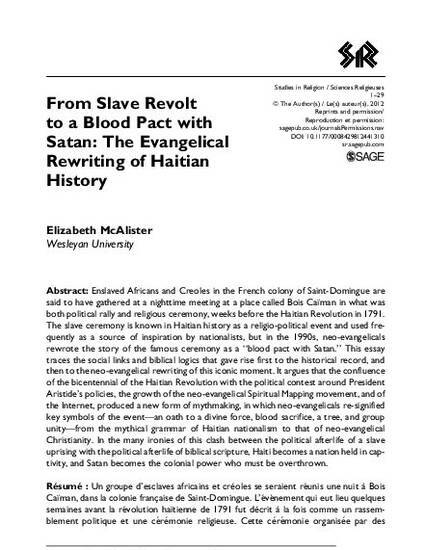 The slave ceremony is known in Haitian history as a religio-political event and used frequently as a source of inspiration by nationalists, but in the 1990s, neo-evangelicals rewrote the story of the famous ceremony as a ‘‘blood pact with Satan.’’ This essay traces the social links and biblical logics that gave rise first to the historical record, and then to the neo-evangelical rewriting of this iconic moment. It argues that the confluence of the bicentennial of the Haitian Revolution with the political contest around President Aristide’s policies, the growth of the neo-evangelical Spiritual Mapping movement, and of the Internet, produced a new form of mythmaking, in which neo-evangelicals re-signified key symbols of the event—an oath to a divine force, blood sacrifice, a tree, and group unity—from the mythical grammar of Haitian nationalism to that of neo-evangelical Christianity. In the many ironies of this clash between the political afterlife of a slave uprising with the political afterlife of biblical scripture, Haiti becomes a nation held in captivity, and Satan becomes the colonial power who must be overthrown.